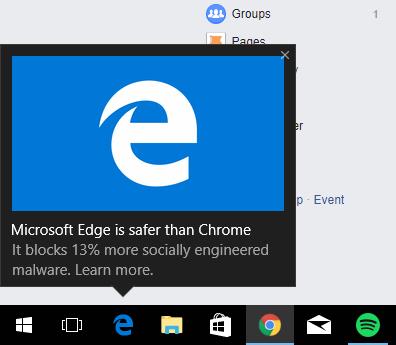 Microsoft Edge is safer than Chrome. Now, as much as I like Windows for its simplicity, I have to express my total and utter disgust at this type of tactic. This is basically the corporate equivalent of a kindergardener pointing to another child and boasting how much better they are than them, in an attempt to increase their own popularity amongst the rest. And you just know that they’re using the fact that their dad is the principal to more easily get away with it. See, that’s the thing… if Microsoft actually had any ounce of fairness in their use of this tactic, I might be more tolerant. For example, if they routinely referenced impartial external studies that they didn’t finance in any way, and then used the findings to suggest superior apps, then great. That sounds a good feature for Windows, a good way to help raise security and performance across the entire Windows userbase. But you just know that they’re just doing whatever they can to get you to use their products – it’s not about the greater good, it’s about their greater good. There’s no way they’ll put a pop-up above a non-Microsoft app and say “X runs 35% faster than Edge.” And, let’s face it – they kind of need that extra boost – most of the time, Microsoft products forever play catch-up to far more innovative companies. This whole situation sounds familiar, though, doesn’t it? Haven’t we seen unfair tactics before? Oh right, the 1998 antitrust case, United States v. Microsoft Corporation. On May 18, 1998, the Department of Justice filed antitrust charges against Microsoft. The charges were brought to determine whether Microsoft’s bundling of other programs into its operating system constituted monopolistic actions. The suit was brought following the browser wars that led to the collapse of Microsoft’s top competitor, Netscape, which occurred when Microsoft began giving away its browser software for free. Ultimately, Microsoft lost this case, and ended up having to settle. [T]he Court concludes that Microsoft maintained its monopoly power by anticompetitive means and attempted to monopolize the Web browser market, both in violation of § 2. Microsoft also violated § 1 of the Sherman Act by unlawfully tying its Web browser to its operating system. Click “Settings,” the small gear icon. Click “System,” the top left option. 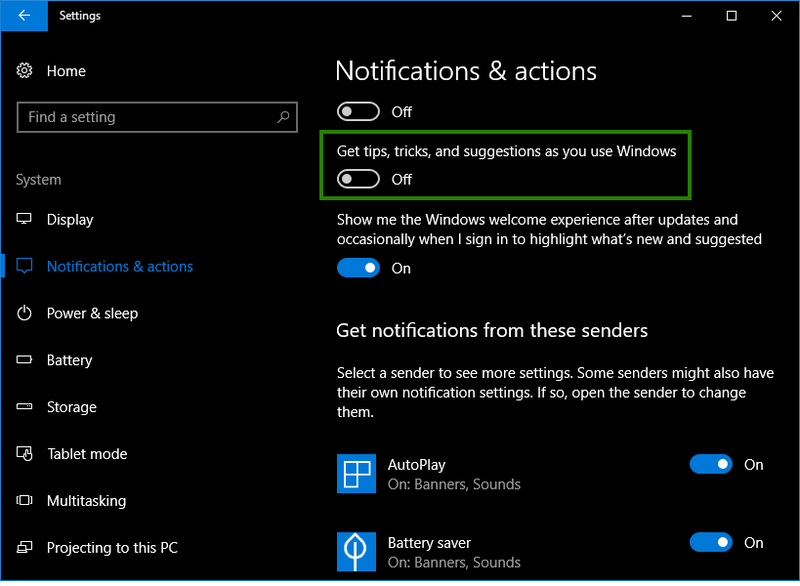 Scroll down until you find the “Get tips, tricks, and suggestions as you use Windows,” and turn it Off.